Raw beef is no stranger to Western culinary tradition. Steak tartare and beef carpaccio have had their day in the sun, and few things embody the spirit of the red-blooded American chophouse more than a black and blue strip washed down with a dry martini. But the Eastern hemisphere is chock full dishes that showcase the carnivorous pleasures of uncooked beef, and Glendale’s Phở Avina prepares an exceptional version of bò tái chanh, a Vietnamese salad that blends the herbaceous, the bright, and the beefy. Phở Avina is run by Avina Pham, whose family endured enormous hardships during and after the Vietnam War, but escaped imprisonment, moved to America with the aid of a sponsor church in Des Moines, Iowa, and eventually settled in the Phoenix area, where they have operated Vietnamese restaurants for nearly 25 years. 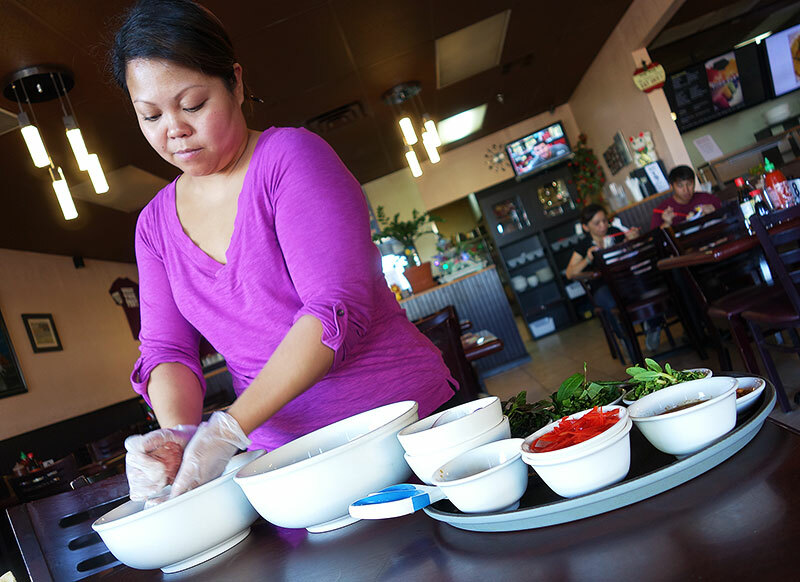 Avina’s mother, Thanh Nguyen, opened Avina’s Vietnamese Cuisine in 1990, and after the family sold it in 2006, Avina decided to strike out on her own. 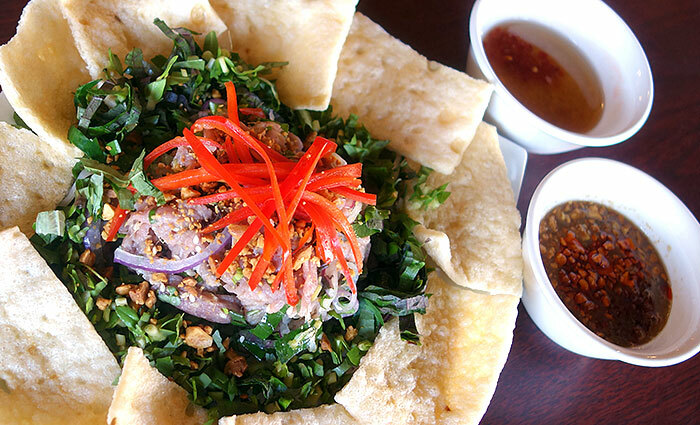 Now, in a spacious and pleasant storefront restaurant across from the ASU West campus, Avina serves the southern Vietnamese fare typical of her mother’s hometown of Cần Thơ, while working in some of the central Vietnamese dishes familiar to her husband, whose family hails from Đà Nẵng. Though Phở Avina serves excellent versions of the soup, noodle, and rice dishes typical of the multitude of southern Vietnamese joints that dot the local desert landscape, digging a little deeper into the menu unearths some lesser-known gems like bò tái chanh, a raw beef salad commonplace in Cần Thơ and American cities with larger populations of Vietnamese immigrants, but nearly unheard of in the valley of the sun. And though Avina’s care and presentation give her bò tái chanh an air of refinement, in Vietnam the dish is — in a manner of speaking — booze food. It’s quick and simple to prepare, readily available at roadside stands and downscale drinking establishments, and packed with the kind of explosive flavors that go great with beer. As with so many Vietnamese dishes, one of the cornerstones of bò tái chanh is an abundance of fresh herbs, which in Avina’s version are the three you see pictured here (from left to right): rau răm (Vietnamese coriander), tía tô (red perilla), and ngò ôm (rice paddy herb). These herbs are commonplace in Vietnam, if a little tricky to locate in Phoenix (Mekong Supermarket in Mesa usually carries all three). Though most often translated into English as Vietnamese coriander, rau răm is also sometimes referred to as hot mint, which may be a more fitting moniker. Its flavor is, indeed, reminiscent of cilantro, but its most striking feature is a unique, bracing spiciness for which there isn’t a ready substitute. Tía tô is a close cousin of the herb Japanese food lovers will know as shiso, and this Vietnamese variety — green on one side, deep purple on the other — is more assertive, its fuzzy leaves possessed of a peppery complexity. Ngò ôm is used throughout Southeast Asia (though by different names in other countries), and its crisp leaves and stems harbor a light, citrusy character punctuated by a distinctly cumin-like spiciness. While Avina’s bò tái chanh, like ceviche, is technically cured in lime juice, it’s an exceptionally quick citrus bath — the beef is raw when you order. Thin slices of eye of round are dressed with the freshly squeezed juice, and left to marinade for just a minute or two while other ingredients are assembled. The large pieces of steak are then sliced into smaller, bite-sized pieces, drained and lightly squeezed out, then tossed with a dressing of soy sauce, sesame oil, and sesame seeds. Avina slices onion paper-thin, then dresses it with a sweetened vinegar before it is drained and added to the beef. The three herbs are chopped and mixed together, and arranged around the edge of a plate along with more of the onion. The beef is placed in the center of the plate and topped with crushed peanuts and slivered red bell pepper, and the salad is served with crunchy puffed shrimp crackers and two sauces. On the left is nước mắm gừng, a crowdpleaser of a sauce that adds loads of grated ginger to a sweetened mix of fish sauce and lime juice. On the right is mắm nêm pha sẵn, made with mắm nêm, a viciously pungent cousin of fish sauce that mellows into a fabulously complex and delicious dip when cooked with pineapple, lime juice, and assorted aromatics. Despite the careful plating, eating bò tái chanh is a decidedly DIY experience. Pick up a shrimp cracker, add a little beef, top with some herbs and a splash of sauce, and eat it much like a snack food. The flavors play like a snack food as well, vibrant and intense, at once sour, salty, sweet, crispy, citrusy, nutty, and herbaceous. Though the flavors are nothing short of explosive, the smooth acidity of the lime-cured beef and freshness of the herbs keep it light and refreshing, any oxymoronic sort of cooling spice that cries out for hot weather and cold beer. And between the puffed shrimp cracker, crisp herbs, crunchy peanuts, and lightly chewy beef, the textures are as varied as the flavors. The nước mắm gừng — the ginger sauce — is the one that nobody doesn’t love, and in the absence of the salad it would be tempting to simply do shots of the sauce. But the mắm nêm is the more complex — and in my opinion the more rewarding — of the two, and it adds a lightly funky depth that takes the salad to a completely different level. It’s dishes like these that serve as a needed reminder that there’s far, far more to Vietnamese cuisine than the standard-issue phở/bún/cơm triumvirate, and for those who would endeavor to dig a little deeper, a well-prepared bò tái chanh is an excellent start. Phở Avina is located in Glendale at 4920 W. Thunderbird Road, just across the street from the NW corner of the ASU West campus, and they can be reached at 602.439.2547. They’re open for lunch and dinner every day but Sunday, and the place is usually hopping. Resist the urge to get yet another bowl of phở, and instead go for the intensely beefy Bún Bò Khô (beef stew), or the mellow, smooth Cơm Cà Ri Gà (chicken curry). Fans of Bánh Xèo (shrimp and pork rice flour crepe) will not find a finer Vietnamese crepe in the city than this shatteringly crisp and generously-stuffed version, and the Bánh Mì — stuffed with enormously flavorful fillings and a smear of creamy, pate-spiked mayonnaise — expose certain popular California-based bánh mì chains that shall remain unnamed as the dumbed-down fast food they are. Scour the menu and dig deep… there’s lots to love here. 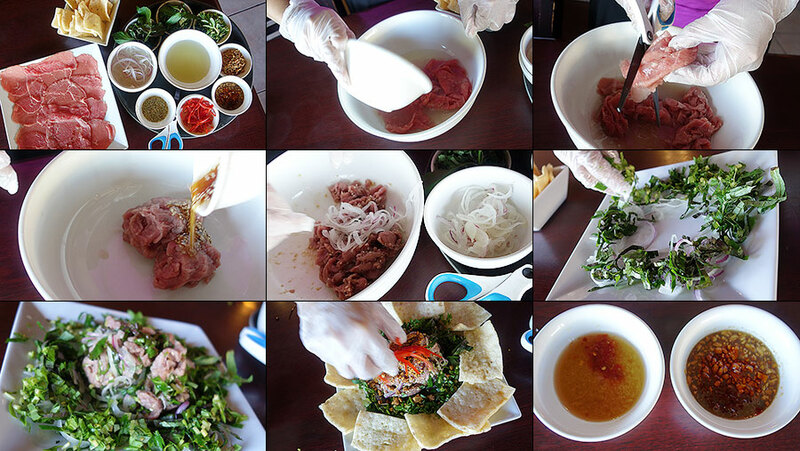 This entry was tagged Asian, beef, bo tai chanh, Vietnamese, Vietnamese herbs. Bookmark the permalink.